Buon giorno and welcome to Stefano’s RomeCabs, Rome’s Leading Company for Airport Transfers, Civitavecchia Transfers, Day Tours from Rome, and Shore Excursions from Italy’s main cruise ports. When searching for a transfer online, you will find many sites and Google ads advertising cheapest prices, budget rates, lowest prices in town… usually accompanied by stock photos of new shiny Mercedes sedans and vans and well suited chauffeurs for a glamorous appearance of luxury at rock bottom prices. Multiple websites offering unbeatable prices pop up left and right. They draw in budget minded travelers hoping to snag a good service on the cheap. However, when further researching these companies’ reputation online you soon discover that their performance is not as stellar as their webpage presentation. They often fail to deliver on their promises. And in the end you do get what you pay for. This is often the case in Rome and elsewhere in Italy. Competition for lower rates does not mean competition for the best quality of service. To cut down prices to the bare minimum means cutting down quality of service, vehicles, drivers, reliability, and safety to meet bare minimum standards. Quality comes at a price. Quality cannot be had on the cheap. Newer and deluxe model vehicles cost more, regular vehicle maintenance done at industry standards service centers are pricey, top of the line insurance policy to cover passengers is very expensive, the best possible drivers and office staff require fair wages. All these quality components add to the overall overhead expenses. Quality and reliable service can be offered at good prices, not cheap. Companies that compete on quality and reliability of services are usually rated more favorably by their customers and have fewer complaints. In what ways do companies that provide GOOD vs CHEAP service differ and how does it affect their clients? Here are some of the most common examples from years of experience in the transfer and tour industry in Italy. Companies that compete on quality usually have newer models of comfortable Mercedes or Opel European deluxe model vehicles in their fleet. These vehicles are more comfortable and more reliable. They are less likely to break down and wear out. They also cost a pretty penny and also expensive to properly and regularly maintain at car service centers that specialize in Mercedes or Opel vehicles. You also feel special traveling in a deluxe vehicle making your trip more special as well. Companies that compete on prices usually use older vehicles, or inexpensive models like Renault, Fiat or Ford. These vehicles are generally not as reliable as their newer deluxe counterparts, and cheaper to fix at local mechanic shops. Rarely you find new shiny Mercedes sedans pictured on their website. Properly and routinely maintaining the vehicles is not just a matter of vehicle reliability but safety as well. When vehicles are taken to industry standard service centers for proper maintenance and repairs there is a higher level of reassurance that the vehicle is properly taken care of. Not cutting corners on car parts, tires, maintenance and repairs cost more, however reliability and safety are priceless. Properly maintaining the vehicle body and fixing common scratches and dents also adds to overall costs. Keeping a vehicle beautiful is not cheap. Because vehicle maintenance and body work is expensive, to keep prices cheap maintenance is not always done regularly, the tires are not always the best, and vehicles are maintained at local inexpensive mechanics that don’t always guarantee their work like a reputable car service center would. This results in vehicles not fixed properly, breaking down more often, and not being entirely safe. Body repairs to fix dents and scratches are often overlooked in order to cut on expenses. Companies that compete on quality look for and hire the best, most experienced, safe, reliable, professional, dedicated and customer oriented drivers available. As in any industry, the greater the experience and quality of performance, the higher the salary compensation – which is fair. It takes more than just obtaining a chauffeur license to be a good driver worthy of a company that competes on quality. The higher calibre of chauffeurs also demand a higher pay for their experience, efforts and dedication to quality of service. As a traveler and passenger you expect a driver to be on time, presentable, helpful, have a pleasant personality, and most of all be a careful and safe driver. Unfortunately these are qualities not shared among all professionally licensed drivers, therefore careful selection of drivers is very important when competing on quality of service. Anyone can be a professional driver if they obtain a special license. But the license alone doesn’t guarantee great drivers that meet all the high demands of a company focused on quality. One of the many ways companies that offer cheap prices cut corners is hiring inexperienced drivers, or any drivers willing to work for little pay. Afterall, if they charge little for services, they also pay their drivers very little. To earn a livable wage, these drivers have to work very long hours of continuous back to back services that render them too exhausted to safely perform their duties. Exhausted drivers are also not safe or reliable drivers. In the end the clients pay the price of having underperforming and tired drivers. In the long run these drivers’ performance drops because as in any profession if someone feels is being underpaid and over worked, they compensate by underperforming. Driver turnover is also high in these companies. Before clients meet their drivers, their first encounter is with the office staff either via email or booking a service. The office staff are also the first impression potential clients have about a company: are their emails responded professionally and requested information provided, are their bookings confirmed accurately and in a timely manner, are their services dispatched correctly? Cusotmer service is very important when competing on quality. Finding professional and reliable office staff is as huge a challenge as finding equally professional and reliable drivers. Careless oversights, failure to pay attention to details, unprofessional responses can lead to customer dissatisfaction and failure to provide the services required. Training office staff is also a long term expense and investment for a company dedicated to quality customer service. Reliable and dedicated office staff also requires a fair wage and compensation for their efforts of providing clients with quality customer care. Another way to cut corners when offering cheap prices is to hire office staff willing to work for less. Underpaid office staff are not nearly as enthusiastic or diligent in their duties as their equivalent who are paid a fair wage for their important office duties. Their morale and level of dedication are low. As a result, emails are not answered in time, little effort is put into customer service, and bookings get lost or not dispatched correctly. Consequently clients are left frustrated and waiting for email replies or left stranded altogether. Absenteeism, turnover rates and employee disloyalty is high among these cheap priced companies which in the end harm their clients and reputation. Scheduling transfers with ample time in between each service to accommodate potential traffic and airport delays is very important when a company is focused on quality and timely service. Unforeseen delays can happen at any time and to anyone. By scheduling transfers with enough time in between each one ensures drivers are not obliged to rush from one place to another (often with clients in the car), arrive late for pre-scheduled pick ups, or not show up at all. This also means booking less transfers in a day so each client and each individual service is well taken care of – which runs counter to those who are more focused on mass transfers and routinely schedule too many services to make up for charging cheap prices. Companies focused on quality understand that overbooking results in disappointments when services are not provided on time, drivers are rushed and stressed, or services not provided at all due to delays compounded over the course of the day. In order to be able to survive offering cheap prices companies need to make money by providing as many transfers in as little time as possible. It becomes a mass transfer service. Transfers are scheduled with minimal time in between and and often overbooked to squeeze in as many in a day as possible with little regard to risks involved. The problem with that is that delays happen. Flights are late. Luggage delivery is delayed. Clients’ baggage is lost and they need more time to file paperwork. Traffic in large cities like Rome is an ever present problem. By over scheduling transfers with insufficient time between each service to accommodate common delays, many services end up provided late or not at all when drivers are so far behind they miss services altogether. This leaves their clients late catching their flight or cruise ship, or left stranded altogether and desperately trying to find a last minute alternative transportation. The one thing all the desperate travelers and cruisers who called us needing urgent help with transfers after they were left stranded and no one answered their calls had in common is they booked with budget websites offering cheap prices. Many if not most of these travelers overlooked the spotty reputation of these companies hoping that what happened to others won’t happen to them. That’s a costly risk not worth taking when in a foreign country and you have a cruise or a flight to catch. Companies dedicated to quality service understand the value of buying the best and the top of the line insurance policies that will best cover their passengers in case of emergency. Insurance in Italy is quite expensive, however, this should not be considered a luxury or something to cut corners on. A company that cares about its clients, passengers, and drivers don’t skimp on liability insurance. Because liability insurance is expensive, in order to cut corner, companies that offer cheap prices have little choice but to buy minimal insurance that barely covers damages to passengers. With skeletal insurance policies, passengers are not covered should an emergency occur causing them huge personal losses that will not be properly covered by insurance and never recuperate from the company itself. A strong and continuous focus on CARE in Customer Care and putting the client first is a key element at all companies that compete on quality. This means that the clients’ needs and satisfaction are always top priority. It means going the extra mile even if not necessary. It means following up with the clients to ensure their service was provided satisfactorily. It means doing right by the clients when things go wrong. It means doing all of the things mentioned above carefully in order to make their clients’ experience and service superior. It means CARING about the clients and always making them Top Priority. All companies need to make money to survive. Just because a company charges cheap prices doesn’t mean they make LESS money. It means they cut corners as much as possible, and squeeze in as many services as possible in order to make reasonable profit. And just because a company charges more it doesn’t mean they make MORE money. As outlined above, providing continuous quality service comes at a price because quality costs more. When quantity matters more than quality, the level of customer care is compromised. It’s not possible to put clients first when creating an environment where customer service is not prioritized and often compromised. It’s not possible to go the extra mile and accommodate clients whose flight is late or luggage is delayed when overbooked in order to pack in as many services in a day to draw a reasonable profit. It’s not possible to promise on time service when scheduling transfers so close that sooner or later on time service is no longer attainable. It’s not possible to provide clients with the best drivers when the low pay only attracts those who would not make the cut at companies that focus on quality. Overall, it’s not possible to provide continuous quality service and putting clients first while cutting corners at every turn. Quality comes with a price, and in the end you often you do get what you pay for. Further, you can’t put a price on the peace of mind knowing you’re in the good hands of a reputable company dedicated to your satisfaction. When you have a flight or ship to catch,, is it worth saving a few Dollars or Euros and take a chance with a company that has cheap prices but a spotty reputation? If things don’t go as planned it’s far more expensive missing your flight or ship. Buon giorno and welcome to Stefano’s RomeCabs, Romes prominent company for trusted Airport Transfers and Civitavecchia Transfers, Day Tours, and Shore Excursions. Our goal is to help make your trip to Italy the most exciting and memorable holiday of your life! In this article we offer you 10 reasons to book your Transfers and Tours with Stefano’s RomeCabs, which are the reasons why tens of thousands of happy travelers have booked with us for more than 12 years. 1 Stefano’s RomeCabs has been more than 12 years in business, and counting! Stefano’s RomeCabs has been in business for more than 12 years with continuous reliable and quality service, never deviating from the Customer First philosophy that made RomeCabs a huge success and set the standards for other companies after us to follow. Highly informative and user friendly website prepares your in advance with information about our services. 4 See and Watch before you book! Our photos and videos of our day tours and shore excursions offer our guests a glimpse into what they will expect to see. 5 Honesty, integrity, transparency in prices and service. Our company policy is being completely honest with our clients about the services we provide. Our policy is to be completely transparent about our services and prices because a well informed traveler is a happy and satisfied traveler. We want you to know exactly what to expect from us so you only have pleasant surprises. We NEVER over promise to lure clients and then under deliver to disappoint them. Our prices are prominently published on our website so our clients know in advance if our prices fit their budgets. While other companies do NOT reveal their prices publicly in order to adjust prices based on various client criteria or to lure clients into contacting them in order to use sales pitches to hook them, our prices are published for everyone to see with nothing to hide, no hidden costs. 6 Our prices are fair and competitive with our peers. While there are companies and website that operate on a “budget” system therefore compromising on quality and reliability of service in order to compensate for expenses required to provide high quality service, our prices are competitive (and even lower in many cases) with our peers who provide equal type of service as we do. 7 All our services are private to ensure precise customized and expectancy of service. On our transfers our clients rest assured that they will not have to share their vehicles with strangers, their driver will not make unpredictably numerous stops that can delay their transfers, and they will not have to wait at the airport for “other parties to arrive”. When you book with Stefano’s RomeCabs, our focus and attention is 100% on you! 8 RomeCabs also offers tours, making it your trusted companies for tours and transfers. You don’t have to juggle multiple companies for transfers and tours, we can take care of everything for you! Stefano’s RomeCabs offers Day Tours from Rome, Shore Excursions from the Cruise ports of Civitavecchia, Livorno and Naples, as well as Sightseeing Transfers between Rome and Florence or between Rome and Amalfi Coast region. We also offer customized tours and transfers in many regions throughout Italy upon request. Our office staff is fluent and proficient in English to accurately answer our clients’ emails, process their reservations, and assist with emergencies by phone. You don’t have to know Italian to speak with us! 10 Stefanos’ RomeCabs does not require advance payment, Credit Card information to hold your services. Many our our clients are grateful not to have to give out their credit card numbers with so many internet hacking and risks of stolen credit card number that plague the internet. We operate on the honor system, we don’t take your credit card number as collateral. Payment options are easy, safe, and clear on our confirmation emails and website. Thank you very much for choosing Stefano’s RomeCabs for your Airport and Civitavecchia Transfers, Day Tours and Shore Excursions in Italy. Hello and welcome to Rome! Thank you for booking your transfer with Rome Cabs Limousine Car Service, Rome’s leading company for Transfers, Tours and Shore Excursions. 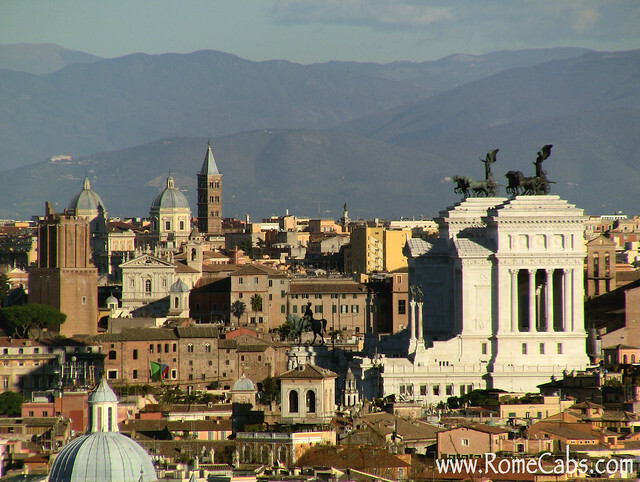 Your safe and comfortable arrival into Rome from the airport is our top priority. Once you’ve arrived at Rome’s Fiumicino Airport, you must first clear customs, retrieve your luggage at the appropriate carousel, and then follow the signs to the exit doors to meet your RomeCabs chauffeur! There are 2 terminals you could be arriving at: Terminal 1 and Terminal 3, depending on the airline you’re flying with. However, most international flights arrive at Terminal 3. If you arrive at Terminal 3, you will exit through the doors, and enter the waiting area where travelers are met by friends, family, and of course, their private drivers. Meeting your RomeCabs chauffeur at the meeting point is easy. 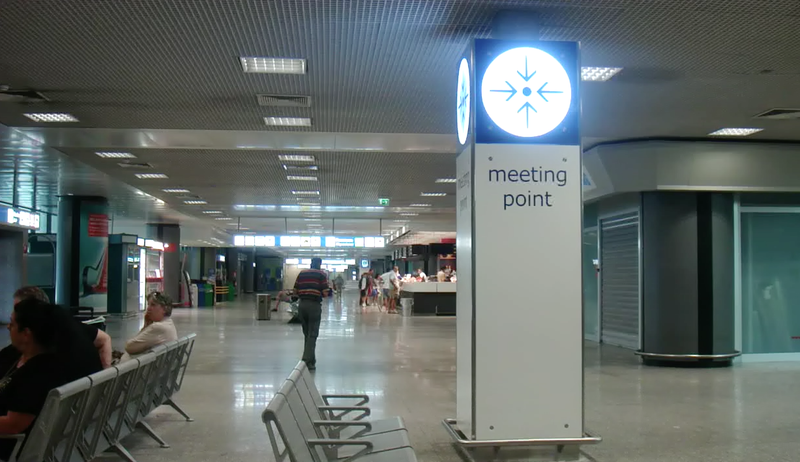 Upon exiting the doors into the waiting area, turn to your left and a few yards away you’ll notice a large blue and white square column with a sign at the top that reads Meeting Point. Your Rome Cabs Driver will be waiting for you near the column with a sign bearing your name. If you are flying with KLM, AirFrance, or are flying domestically within Italy, you will arrive at Terminal 1. There are 2 exits at the opposite ends of this terminal: 1 exit without luggage, and 1 exit with luggage. Your driver will meet you at the identical looking Meeting Point column located between these two exits, but a bit closer to the Exit With Luggage. 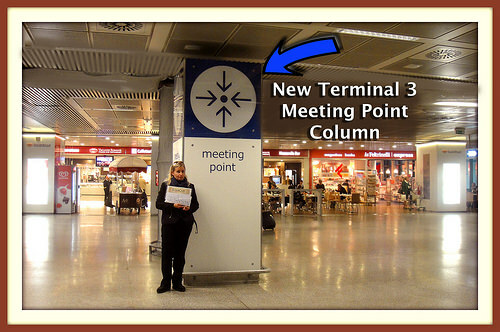 If you are arriving WITH luggage, turn RIGHT and walk to the blue and white Meeting Point Column. If you are arriving WITHOUT luggage, turn LEFT at the corner of Chef Express and walk to the Meeting Point Column. Flights that arrive at Terminal 5, Terminal 3, or Terminal 2, will exit through Terminal 3. Flights that arrive at Terminal 1, you will always exit through terminal 1. If you do not notice your chauffeur at or near the Meeting Point column, please do not exit the airport to the taxi waiting area outside. Do NOT exit the airport and walk outside as your driver will not be there. If you are experiencing any airport delays call our office immediately so we can assist you. Thank you very much and we look forward to be of service to you in Italy!